The U.S. Air Force began flying tons of aid to a Colombian town on the Venezuelan border on Saturday as part of an effort meant to undermine socialist President Nicolas Maduro and back his rival to leadership of the South American nation. 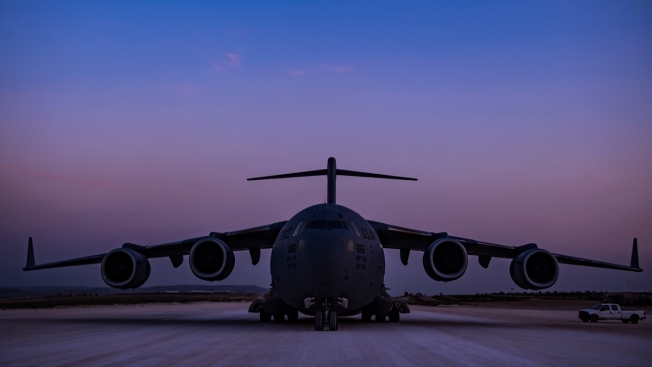 The first of three C-17 cargo planes took off from Homestead Air Reserve Base in Florida and landed in the Cucuta. That border city, swollen by a flood of migrants from Venezuela, is a collection point for aid that's supposed to be distributed by backers of Juan Guaido, the congressional leader who is recognized by the U.S. and many other nations as Venezuela's legitimate president. Previous aid shipments came on commercial planes, which is aimed at dramatizing the economic crisis — including hyperinflation and shortages of food and medicine — gripping Venezuela under Maduro. Critics say last year's re-election was fraudulent, making Maduro's second term illegal. Maduro has been using the military, which remains loyal, to help him block the aid from entering Venezuela, describing it as "crumbs" from a U.S. government whose restrictions have stripped his administration of control over many of its most valuable assets. 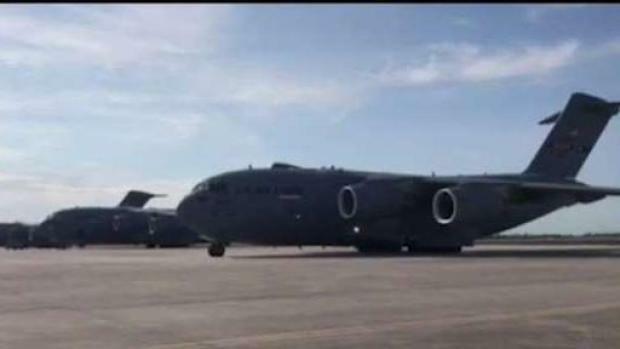 A U.S. military plane left for Venezuela Saturday with aid for Venezuelans. NBC 6 Reporter Erika Glover has the story. "They hang us, steal our money and then say 'here, grab these crumbs' and make a global show out of it," Maduro told The Associated Press on Thursday. "With dignity we say 'No to the global show.' Whoever wants to help Venezuela is welcome, but we have enough capacity to pay for everything that we need." Members of his administration have alleged, without evidence, that the aid packages are contaminated. Saturday's 180-ton shipment includes high-energy food products or hygiene kids of soap, toothpaste and other goods for more than 25,000 people. Guaido has called for an effort on Jan. 23 to bring the aid into Venezuela, though it's not yet clear how they might overcome Maduro's blockade. Several thousand doctors, nurses and other people gathered at a parking lot in eastern Caracas on Saturday as part of an effort to enlist 600,000 volunteers to distribute or provide aid on the part of the opposition. Anibrez Peroza, a 40-year-old nurse, said she was ready if necessary to go to Cucuta in a caravan to bring in the aid. Seth Meyers takes a closer look at President Donald Trump considering the possibility of using military force in Venezuela. "We have to do something to save so many people who are suffering and dying for lack of medicine," she said. Peroza wept as she described a dehydrated child dying in her arms for lack of a catheter to rehydrate him. In addition to Cucuta, aid collection centers have been set up in Miami, the Brazilian town of Roraima and the Dutch Caribbean island of Curacao. The U.S. and widespread European recognition of Guaido complicates Maduro's efforts to find funds to keep his government, and its own food programs, running. The U.S. has placed Venezuela's U.S. assets, including oil company Citgo, under Guaido's control and bans financial transactions by Maduro-controlled entities. Scores of Venezuelan officials also face personal financial sanctions in the United States. On Sunday, a collection drive will be held for Venezuela in Miami. The drive will take place at 11421 NW 107th Street, Suite 13. They will be collecting medication, vitamins, non-perishable food items, baby formula, and more. They will not be collecting clothing, toys, or bedding.